So you know how we love positivity and all that? Not on my blog post today. Today is going to be a very biased "thoughts" about peel off masks. So if you really can't take the negativity in this post, my feelings are all in the title. If you want to read how "triggered" I get about masks, read on (I will try to tune it down). I don't actively purchase these masks (I've done it once back in 2014) but this month's GlossyBox came with one and I had to use it anyway so I can submit a review. In short, this particular one isn't too bad, but not every peel off masks are like that and just because these peel off masks don't work on my skin and I hate it, doesn't mean you should too. So this happens every time. It could be because I'm clumsy, but I'm certain that this doesn't JUST happen to me. Tell me I'm not the only one. This stuff is a nightmare to get off too and I've learnt the hard way to not wash with water, and use a dry toilet paper/tissue instead. I opted for fingers because they are much easier to get off than a face mask brush. I've had experience with ones that just wouldn't budget and it's a mixture of water, soap, scrubbing, then more scrubbing with tissue to get it off my fingers. So you probably thought, "oh I need a little on my nose, and seeing that I've got some product left, I'm going to apply more around the chin too". Until you discover that it doesn't dry evenly and if you accidentally touch these spots whilst you're waiting for a century for them to dry, you're going to get them on your fingers and end up with a bare patch on your face. So you say, "J, just don't bloody touch your face". How else will I know if all of my mask is dry, huh? HUH? Fine, I won't touch it, I just have to wait for it to dry and feel like it's for reals gripping on to my skin. But there will still be some wet patches that aren't dry. How do other people do this; again, is this just me?? To be fair, this one from Beauty Pro isn't too bad in waiting time to dry. If you've made a mistake like I have by applying it over the brows...that bit feels like it's never gonna dry. 3. I love how satisfying it feels to peel off. NOT. Okay, okay, so it's dry, ish. Most of it is anyway, so I'm so ready to peel this pesky thing off my face. Those videos are hilarious! I'm going to have so many white heads and blackheads peeled off from my face. This is the WORST part for me and one of the core reasons as to why I hate these masks - you have to tug on your skin! This Beauty Pro one wasn't too bad actually, but trust me I've used worse. That peeling feeling really doesn't sit well with me and if you continuously tug on your skin like that, like using nose pore strips (again, something I hate), your pores WILL sag and you will end up with larger looking pores. Also I didn't peel off white heads/blackheads on my face or nose. Thankfully this wasn't one of those that feels like it's glued on to your face, otherwise I'd be in for a ride of discomfort. Also notice how there are still bits left - these are WET SPOTS that I thought was dry. Think again, J, NOT dried. 4. I'm going to have such clear skin! Oh...maybe not? They say these are supposed reveal fresh, clear skin...BUT DOES IT THOUGH??? From the pictures you probably think it does, but I can tell you this is 100% down to the camera being a little further away and not focused on the same spot. In other words, it's not focused at all, so it looks better. That being said, with skincare products, habits are key to having good skin, so maybe if you do this regularly enough, you will eventually peel off a layer of the skin and reveal good skin. But I ain't going through that mess and peeling and tugging at my skin/pores that often I can tell you. The Kiehl's Rare Earth clay mask does a much better job in the first application - no tugging, quick dry and you can TELL if you still have wet spots. Just going to reiterate... you've tugged your skin. I don't know if many people get this or if it's just me (again), but I always have this itchiness/tingly sensation on my face that is not pleasant after I use these masks. It isn't so intense with the Beauty Pro one because it wasn't like one of those that glue on to the face, but it still gave me a little of that feeling. Remember, it's from the tugging of the skin. Also because you've applied it on dry skin, when you peel it, your skin is still dry, if not drier. The mask doesn't inject water in the skin so you're not really getting moisturising factors. I opted in using the 7 skin method afterwards as I felt it was the only way I could rehydrate my skin well in a short period of time. If you have the time I highly recommend using toner immediately and then slap on a hydrating mask or a soothing mask to ease the irritation you've caused your skin. So there you have it, my rant about how much I dislike/hate these peel off masks. In fact, I don't even use them any more and I honestly don't care for this trend of using these peel off masks. 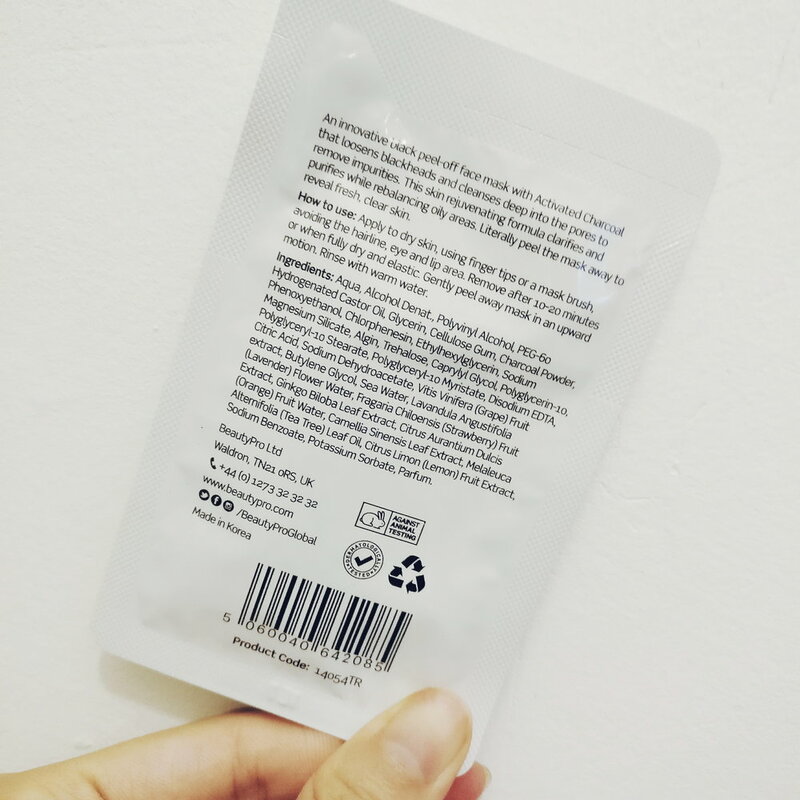 They've been around for ages and if you want to use it on just the nose area, I prefer these over a nose pore strip as that essentially is glue...and well, this at least has other stuff in it and it "soaks in" to the pores. But there are a million of other ways to deal with clearing pores (clay masks!) and skin regeneration (acids) that doesn't involve physically tugging at your skin, which I would say is one of the top things you can do to make your skin age quicker. You won't see it immediately, but doing this long enough and you will see pores looking more like a tear drop or elongated where the skin around it has lost elasticity. What do you think? Do you like these masks? Is it just me who has these problems? How often do you use it and does it give you results?